When I met the lovely Anh last month during our short getaway in Melbourne, one of the things we talked about was how we continue to style and pre-arrange our food shots for our blogs. Nothing is truly real and in situ, sometimes the photography bit of food blogging takes the toll on our energy. Life is Great didn't start out with heavy focus on photography. 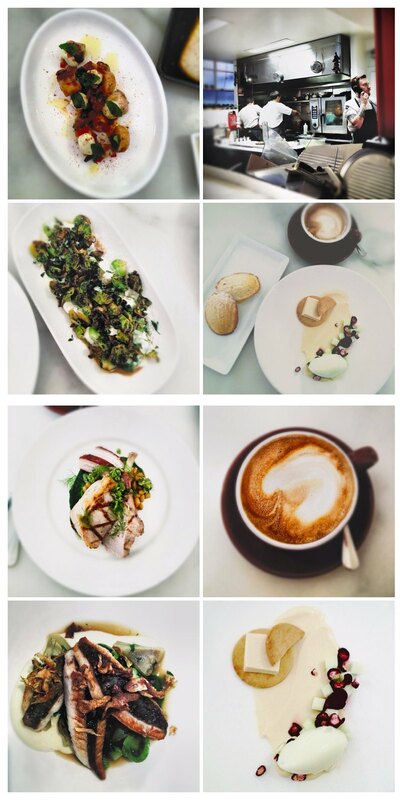 I've always wanted the focus to be on the food, and I still do today. One of my favorite early post was this, where food was shot in the bowl and cutlery we eat from every day, propped on nothing more than the chopping board I cut my onions on. 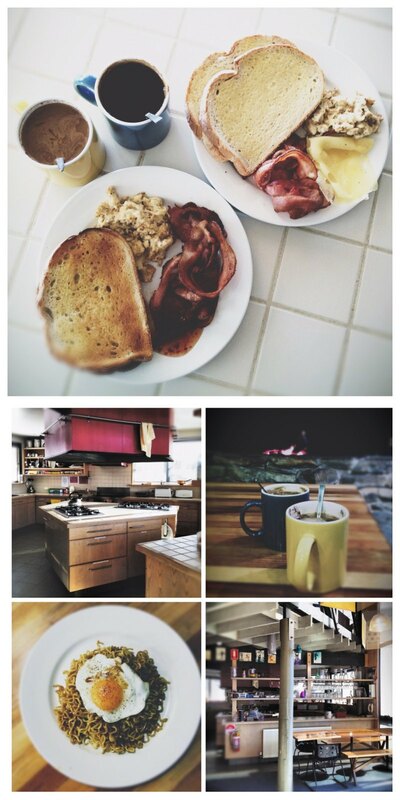 As the blog grew and I bled my artistic veins into the world of food photography, things became a little complicated. While I still shoot plain vanilla sometimes and don't go as far as sketching out compositions (too hungry to do that! ), I still think of plating, setting and propping as long as the dish is set to go on the blog. Ironically, the 5-minutes rushed job of the Spanish Chicken with Chorizo fame gained a nasty feedback on Pinterest, saying how it was made to look better than it actually taste! So this week, ladies and gentlemen, I present you my weekday lunch, whipped up in the shortest time I could manage in this crazy tropical heat, in my as is kitchen. I had a piece of smoked duck breast lying around in the fridge. 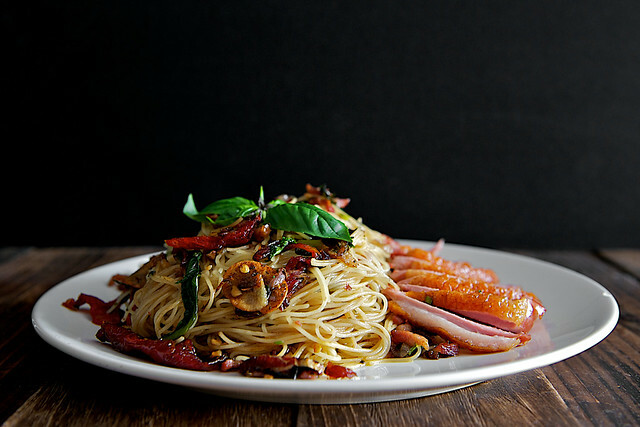 The ensemble was inspired by one of my favorite dish from a place called Delicious back in KL (now also available in Singapore, though the last time I was there I wasn't impressed), a pasta with duck confit and sundried tomatoes. As you can see, my counter top, which is really supposed to be clear of that jar of dried noodles, enamel mug, salt pot, et al. was not at its peak condition. You could even catch that overturned bottle of sambal pedas ABC in the corner rack if you're observant enough. 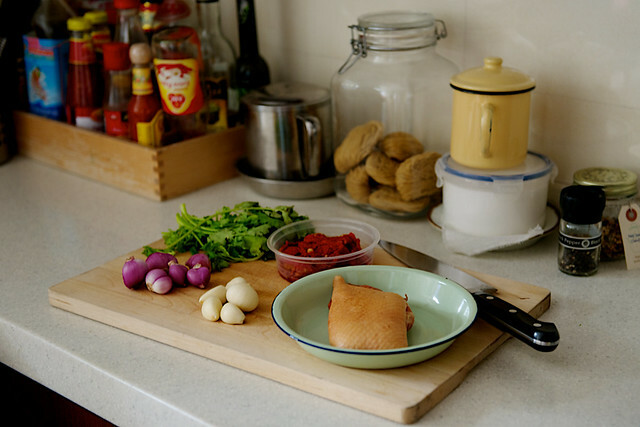 When it was bordering on 34°C in the afternoon, I really didn't want to bother with mise en place but had no choice. If I didn't need the space to slice that duck, all those things you see in the bowls would be strewn around on the chopping board. What you don't see though, are the six pieces of kitchen towels in my kitchen. They range from wet, semi-wet, semi-dry (hanging by the oven door) to dry. I have more of them folded on top of the toaster, just in case. Not that I hid any of them, they just happened to be out of the frame. Because I'm such a kitchen towel hoarder, if you have read Anthony Bourdain's Kitchen Confidential, you'd put two and two together and see that despite cooking in a hurry, my counter was not in a chaos. Not that I cleaned before taking photos, I simply cannot cook while being in a mess. (Hello OCD?!) I have been known to wipe down splashes around the hob while browning meat or stir frying. If more than 10 minutes of a lull period between cooking availed itself, I'd start doing the dishes. So that's how I roll in the kitchen, typically. I wonder if Anh would think that there's enough honesty in this post. I miss our company and Melbourne. 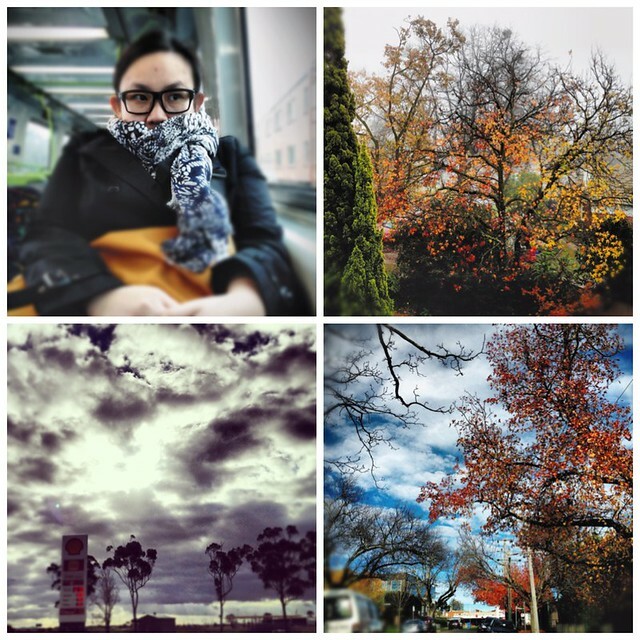 It's crisp air, colorful winter (at least while we were still there), the train rides from Surrey Hills to the CBD, the crazy good cafe culture... I could go on and on, but you get the picture. We ran a tight-like-army schedule right after touchdown and unloading our suitcases, making our way to the visitor center at Federation Square to check out conditions of the Great Alpine Road. 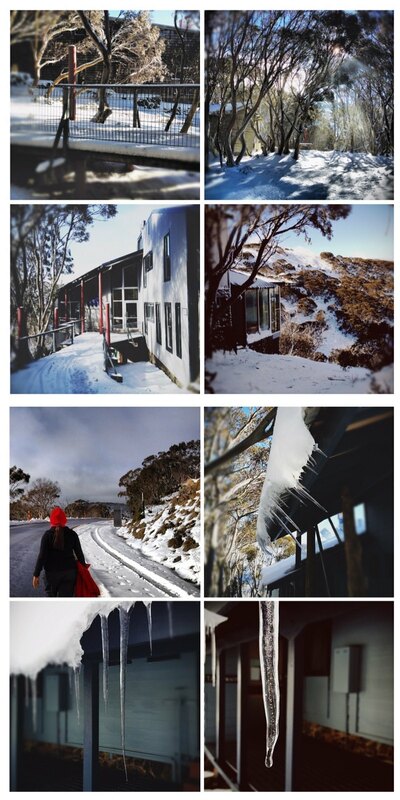 The next afternoon we drove up to Mount Hotham just as ski season began during the Queen's Birthday weekend. Since the crowd haven't descended on the night we arrived, we had the Peninsula Lodge almost entirely to ourselves, from the communal (but equipped to cook really anything!) kitchen and the den to the wood fireplace. Sipping my hot chocolate while the weather read -2°C outside and my boots toasting up in the warm closet room, I immediately regretted not booking an entire week up the mountains instead of just 2 nights. I know, what was I thinking? The entire vacation should've been three weeks and not one. There was no snowfall while we were there but the 6cms of whiteness fallen a few nights before was enough to turn the whole mountain into winter wonderland. And of course I cooked whenever I could, actually regretting not lugging up more produce while we were at Woolworths. I mean, can you see that kitchen? I could've roasted a chicken, made soup and baked pies. But instead we ate instant noodles for supper and at most conjured up the standard bacon, cheese and eggs breakfasts. All the more reason to return for longer next season. With a bit of post-vacation blues still going on, along with the impossible heat and errands to run, I must admit cooking up a storm would be the last thing on my list of priorities. I even used our everyday chipped white IKEA plate for this, did you see that? But at least I fired up the stove and didn't resort to ordering McDonald's, although I must admit there were times I just wished food will magically appear in front of me as I wipe off my sweaty arms trying to position myself directly under the air conditioner. Now if only making a good cold salad would take just as short a time... I shall return with some ideas. Note: This is a thrown together recipe based on the fundamental aglio olio, simply a garlic and olive oil pasta. I'd say go with what you like and have in the fridge at that hungry moment. 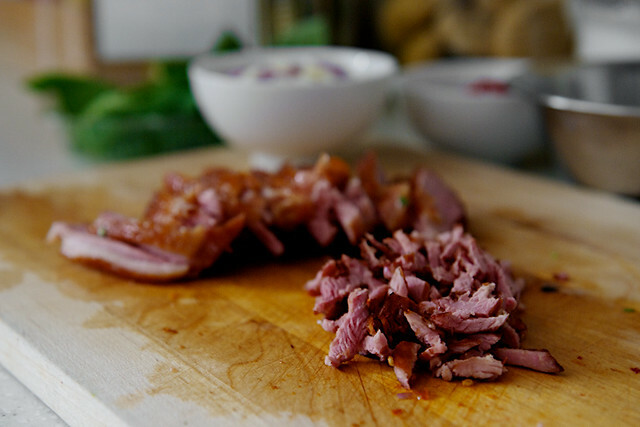 You can use raw duck breast if unavailable, season and adjust the cooking time accordingly. Put a large saucepan/pot of water to boil. Meanwhile, heat up some oil in a frying pan. Over medium heat, sear the duck breast skin side down till crisp, about 5-6 minutes. (If using raw duck, to render the fat will take longer, adjust accordingly.) Flip over and cook another 3-4 minutes. 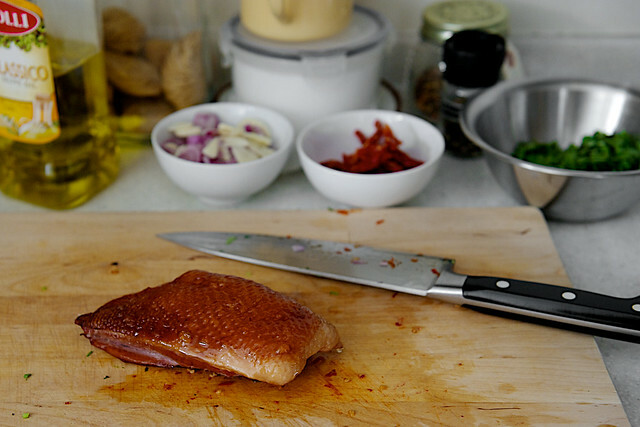 Once done, remove duck from heat to rest on the cutting board, about 5 minutes (or half your total cooking time). Slice the duck thinly, reserving the torn and smaller bits of meat to be included into the pasta. Cook the pasta in boiling salted water for 3–4 minutes or until al dente. Meanwhile, reheat the pan over medium-high heat. Add the butter and oil and cook until the butter has melted. Add the garlic, shallot, chilli and zest and cook for about 2 minutes. Add the tomatoes, some of the coriander, basil and seasoning. Toss briefly, add in the smaller chopped duck breast meat and reduce heat to low. 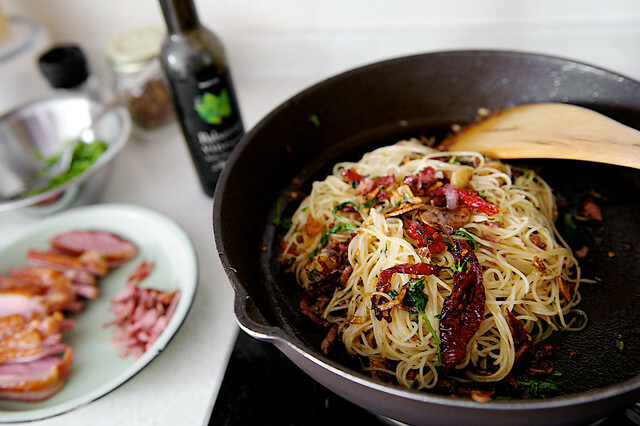 Drain and add the pasta, the remaining coriander and balsamic vinegar, toss well to combine. 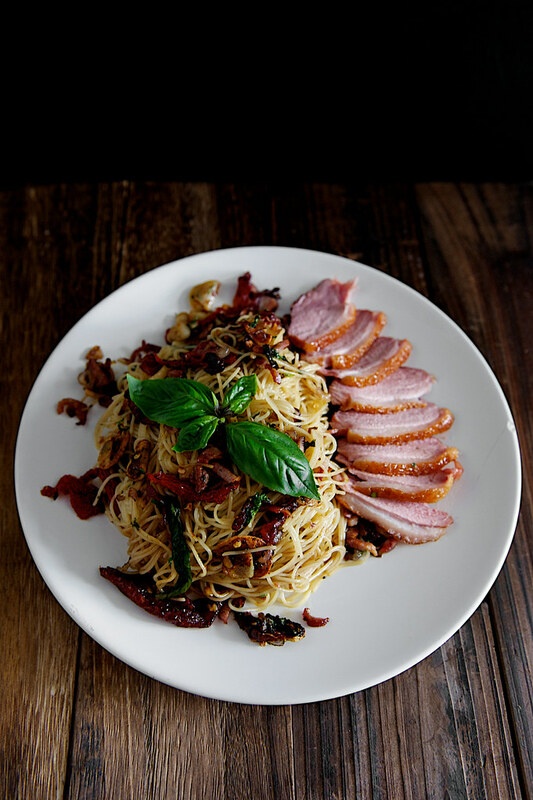 Dish onto serving plates, arrange sliced duck breast on top or the side, garnish with fresh basil, serve warm. WHOAAAA.. i want this! Did u get your smoked duck breast from Cold Storage? A marvelous dish! So flavorful and refined. That looks like an AMAZING mid week lunch - I normally make do with some sort of hurried sandwich or salad (homemade, but still) at my desk! Your photography is absolutely stunning, whether tarted up or plain and simple. Love your blog. That dish looks absolutely divine. I've been trying to improve my photography and whilst I can see I've got better I just think I lack something creatively in terms of composition. I always enjoy your beautiful photos though! and I, too, wipe my hob while I'm in the middle of cooking..and did the dishes too, just like you mentioned. this is so delightfully frank. my beloved is now relegated to watching me do prep work not only for the cooking/baking, but for actual photo taking. incidentally, i find the posts that did not require much effort in picturing taking are usually the ones i get most feedback on... do you find that too? Rosa, thelittleloaf and Bes: Thank you for your sweet comments. I want to balance out the importance being put into photography here because too often now I find myself going to some food blogs just to look at photos and completely ignoring the recipes/contents because they lack inspiration. RibbonClown: Sometimes I hate myself for my OCD, but I just can help it. Angry Asian: In terms of feedback, for my case it boils down to the item. Cakes get more feedback than savories. I love all your holiday photos. And omg the kitchen! I would die to have that kitchen. Gorgeous! And the smoked duck pasta dish, fancy! You make lovely dishes as always! !